Christian theology makes a number of bold assertions about the nature of things. Christian theology contends that the entire cosmos is created, loved and sustained by God. It contends that each and every human being is created in the image of God and that there is no human being anywhere who is not created in the image of God. It argues that there is no place where the Spirit of God is not present. Bishop Tutu is absolutely correct to assert that “Christian spirituality is utterly subversive to any system that would treat anyone as less than a child of God!” Christian theology would argue that there are real differences between religious systems and not every system is healthy or true. But no one exists apart from God, and no one is to be treated as if he or she were any less than a sacred person created and loved by God. As someone else has said, how can we say we love God, and then be quick to do harm to that which God creates and loves? I have seen and heard such ugly distortions of Christian spirituality plastered in public places that it makes me want to choke. I pray that these are recognized as the ideological distortions that they are. 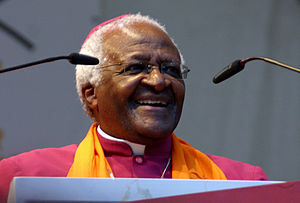 May better voices, such as those of Bishop Tutu prevail. This entry was posted in Ethics, Faith, Journaling, Public Issues and tagged Bishop Tutu, Christianity, creation, God, love, peace by revbillcook. Bookmark the permalink. Bishop Tutu is a wise and wonderful man. Good quote to capture and post. B & N is a favorite go-to place for me too! Desmond Tutu is spot on. Why have we as a culture (of Christians) favored the noisy gong rather than the humility of love??? I am astounded at the lack of love for the brother and sister who clamors for affection and only finds it in the streets. Beautiful. Among all religions there are wise men and women. I wish I could see this lived in our everyday lives all over. What a beautiful, noble mindset. every religion should do it. every human being should do it. I completely agree. We human beings should be taking our inspirations from these words. thanks for the beautiful posts Bill. Lovely post. If the whole world lived this way what a beautiful place it would be!